A great work sits finished, canvas still aromatic with sticky paint on the easel. As you sit back and rest for a minute in that addictive feeling of having completed something you feel great about, you start to move into the next phase of art. Suddenly, it’s not about making art, it’s about showing it. Or maybe you just bought yourself a gorgeous, eye-popping work from your favorite painter, and you want to give the canvas a prominent place in your home. Lucky for you, and your piece, displaying canvas is a fairly easy process with options for pretty much any place you might want the work to shine. The exposed wooden bar on the backside of the canvas is great for attaching brackets or hanging on nails. Before you start picking out a spot on the wall, it’s a good idea to decide whether or not you want your work framed. While framing can often add to a work in a variety of ways, such as adding another aesthetic dimension, protecting the work and even upping its value some (depending on the frame), many artists and art-lovers are choosing to display unframed canvases. This decision is purely up to you, and there’s no right answer. Simply look at the painting, and decide whether it would be enhanced or reduced by a frame. Frames generally come with hanging implements already installed on their back, so to display framed canvas, you just need to put nails in the wall at the desired place and hang the work on the nails. The most common method for displaying an unframed canvas is to hang it, and in this regard you essentially have two choices. You can either install something on the wall to hang the work on, or you can put something on the canvas to hang on a nail on the wall. 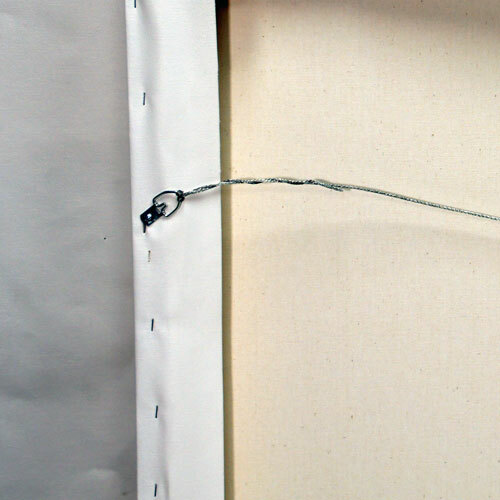 If you think you might move the canvas, and you don’t mind having to carefully insert screws into its frame, its a good idea to install a hanging implement on the frame itself. There are a huge amount of options for this, such as brackets of various kinds (i.e. : a D-ring bracket), mirror plates or ring screws attached to art wire. Some top-notch canvas makers create their canvases with art wire already attached for your hanging convenience, so check your piece to make sure you even need to install anything. 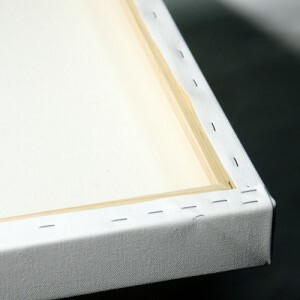 Canvas Lot pieces come with convenient built-in art wires used to hang your canvas. Even with built-in hanging implements, sometimes you need a piece to sit more stable or flush to the wall, and that’s when you’ll want to try out brackets or mirror plates. These can be screwed into the wood on the back of a frame and have a loop or hole that sticks up a bit from the top and/or sides of the canvas, allowing you to slip them over a nail. Like with the framed canvas, use a level to mark exactly where you want your nails, so your canvas hangs straight. It’s also a good idea to remember to hang things at eye-level, otherwise it can diminish the viewing experience. If you’d rather not attach anything to the canvas, or you know that your piece won’t be moving much, try an on-the-wall mount. For a basic mount of this kind, you just need nails or tacks placed in a straight line on the wall so that the lip of the canvas sits on top of them, but there are many better options available than this. Check out the hardware store or art supply store for such items as J hooks, or special picture hanging devices from manufacturers like 3M. These all work essentially the same way, by sticking in or to your wall and providing a surface or point to hang the canvas on by its lip. Some products, like the 3M Command Strip, offer a sturdy way to support your canvas without putting holes in your wall or otherwise damaging it. There are two other ways of displaying a canvas that are worth noting here. If your work is big enough, say four feet tall or more, it’s becoming more and more popular to simply lean the work against the wall at a slight angle. The weight of the piece should keep it in place, but only do use this method if you’re sure that people won’t be bumping into the work at all. A second interesting alternative to wall hanging is hanging a work from the ceiling. For this, just put some eye-screws spaced to the size of the canvas into your ceiling, hang chains from the eyes, and then attach those to brackets in the back of your canvas (you may have to install these yourself). Using one of these methods, you should be able to display just about any canvas in a way that’s both safe for the piece and looks great. Just pick out the ideal spot for your new piece, decide which method would work best for that spot and go to town. Soon enough, everyone in your house will be able to enjoy your spectacular new artwork, and you’ll feel secure knowing the piece was displayed correctly. All that’s left to do now is pick up another canvas, and start the process over again!